The easiest way to install the Dash Wallet for iOS is from the App Store. While older versions of iOS are supported, you will need to be using iOS 10.0 or newer to use the latest version. The source code for the wallet is available here. The following steps describe how to download and compile the wallet from source. Install Xcode from the App Store. The download is about 5GB, so this step may take some time. Open Xcode, agree to the terms and conditions, then close the app. Navigate to ~/Documents/src/dashwallet/DashWallet.xcodeproj and click Open. 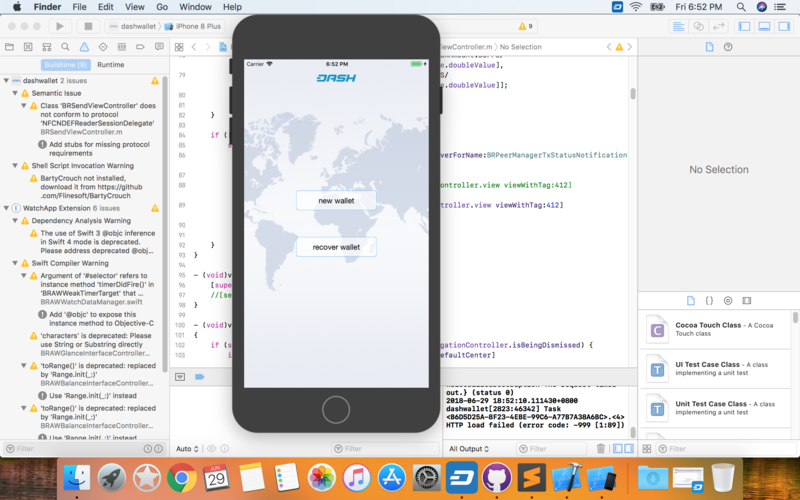 Click Product > Run to build and run the app in Simulator. You can also make modifications to the code and sideload the app onto your iOS device. For details, see this post on Reddit.